Two to three sips of espresso coffee is made even more enjoyable with our line of espresso cup and saucer sets. 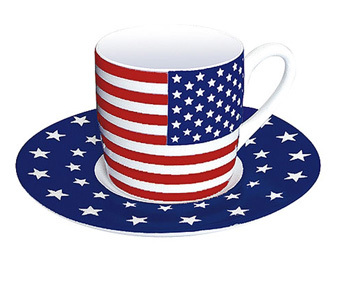 Made by Konitz in Germany, the contemporary design is highlighted by the flag of the United States and includes a matching saucer. Highly durable, these porcelain espresso cups are dishwasher and microwave safe. Saucer measures 4.5" in diameter. Mug stands 2.25" high and holds approximately 3 oz of espresso coffee.